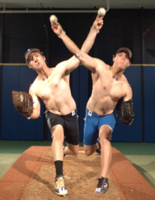 Are there really differences between right-handed and left-handed professional baseball pitchers? Our new study found four biomechanical differences between them. Catch the full article in Sports Biomechanics at this link www.tandfonline.com/doi/full/10.1080/14763141.2018.1429489.